In my last post, I discussed some practices where I think translanguaging pedagogy simply gives us a new mindset on practices that already occur in the language classroom (or at least in my classroom). In this post, I want to focus on an area of the language classroom where I think we could be more intentional about the use of translanguaging, namely social practices in the classroom. In my classroom experience, there is a correspondence between language and social function, where students will use Arabic for classroom tasks, such as skit, or presentation, or discussion, and English for “off-topic” tasks such as phone use or chatting with their friends in class. Yes, there are exceptions, such as students discussing their process in a mix of English and Arabic before making a monolingual product, or the student who decided to joke with his (non-Arabic speaking) friend by texting him an insult in Arabic, but in general this is a pretty clear pattern. Usually, this use of English is dismissed as indicative of a lack of skill in Arabic (they’re not able to have a full discussion of their process in Arabic yet) or students not paying attention (they’re on their phones!). However, I think it’s actually interesting to take a closer look at these processes, and how translanguaging pedagogy could disrupt these patterns to encourage more language learning. When students engage in off-task behavior, why do they tend to use English? After all, they are engaging in this behavior with other students who also know Arabic, so why not use Arabic? Or a mix? I think there are several reasons. 1) Proficiency—sometimes, students just don’t know how to say these things in Arabic. This is an obvious explanation, but also one that I think bears a little more attention. Sure, sometimes they don’t know how to do this in Arabic, but a lot of social talk is pretty basic—we cover where do you live, where did you go, what are you doing this weekend in first year, so in second year students theoretically could do this in Arabic. So proficiency is not the only reason. 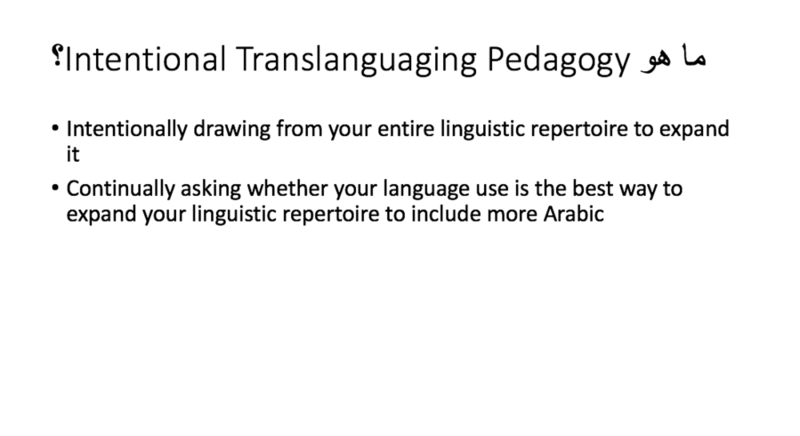 Translanguaging pedagogy could take this even further, by encouraging students to say ask much as they can in Arabic, resorting to English for particularly vocabulary items rather than an entire sentence. 2) Identity—Arabic is for Arabs (or maybe my Arabic teacher) and English is for my American friends. This relates back to the nation-state ideology of language of course, and persists in the classroom when students see using Arabic with each other as “inauthentic” or “fake” compared to using it with Arabs. Of course, since many of the Arabs they are likely to meet at home or abroad also speak English, this leads to future disappointment, when interlocutors with whom the students assume it is natural to speak Arabic want to also use English. Does this mean that the way students talk to each other in Arabic mimics the behavior of Arabs talking to each other? Probably not, but is being exactly like a native speaker the goal anyway? 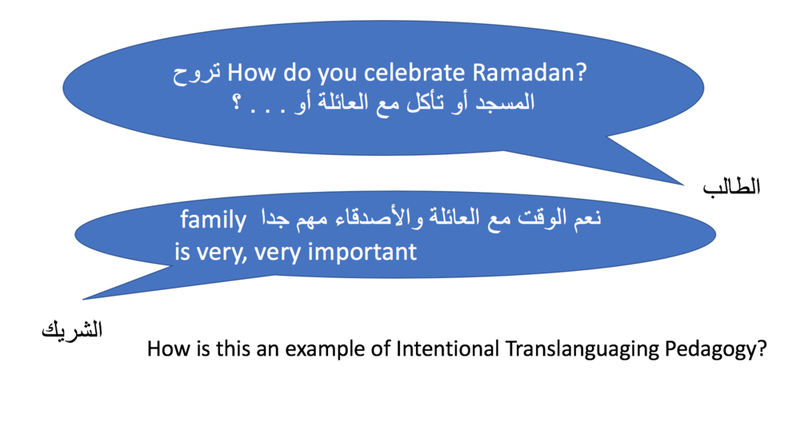 Translanguaging pedagogy, which emphasizes the resources learners have in Arabic rather than those they do not, would encourage learners to use these resources with each other to the extent possible, rather than holding out for an “authentic” experience. 3) Sociolinguistic variation and pragmatics: Social relationships, by definition, involve the negotiation of social distance, stance, and emotion. In language, we accomplish these tasks through sociolinguistic variation and pragmatics. For example, we use more informal language with our friends, pragmatic markers such as well or um, and emotional expressions such as OMG or swearing. In my experience, the language of social relationships is rarely taught in lower level language classes, we instead tend to focus on transactional language (e.g. buying something) or decontextualized language (e.g. writing a description just to describe something). Even in advanced classes, we tend to move on to advanced topics, such as politics or literature, rather than social relationships. 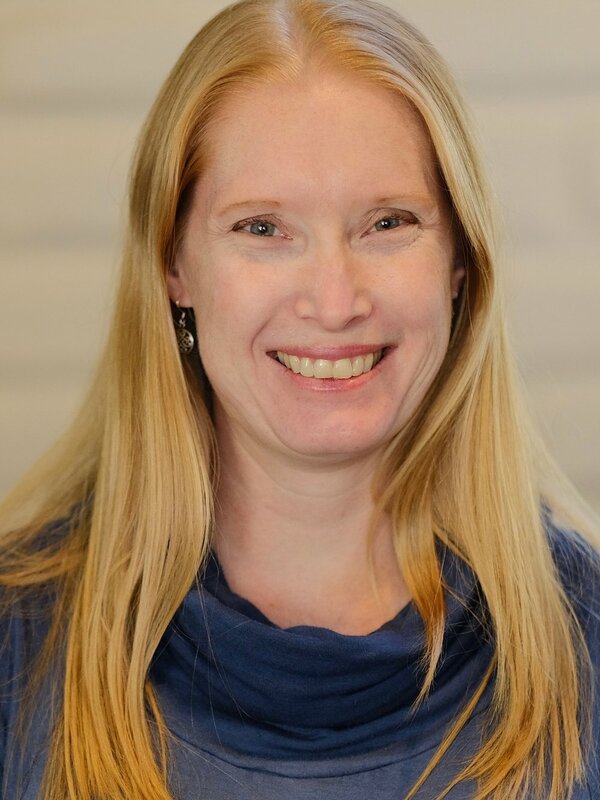 Although we claim to be doing “communicative” language teaching, we are focused on communicating information, rather than social relationships. One reason is our tradition of drawing from formal theories of language for language teaching, which treat this language as “extra”, making it the subject of the advanced language classroom. Another reason is that teaching this type of language is much harder than teaching colors or verb conjugations—there is little translation correspondence, and correct usage depends entirely on the context. Yet translanguaging pedagogy (and functional theories of linguistics) which view language as inseparable from social context, would require us to address these parts of language in the classroom from the beginning, and in more meaningful ways than designating certain forms as categorically formal or informal. In the case of Arabic, this is, of course, a compelling argument for dealing with diglossia and integrating the teaching of Modern Standard Arabic and dialect from the beginning. Sure, you can accomplish any transaction in MSA that you can in dialect (and arguably you could do this in English as well), but can you establish the same relationships? I think it is the latter that is in fact important to students. So perhaps students socialize in English in Arabic class because they are goofing off, and want to be off topic. Students on study abroad are often criticized for just hanging out with co-nationals, or using too much English. Yet what would happen if we focused on developing students’ language to establish and maintain social relationships in lower level classes, in addition to following a path from service transactions to discussing academic topics?